If you happen to be in Northern California on a hot summer night driving between Davis and West Sacramento you might be lucky enough to see one of nature’s grand events. As the sun is setting and the tree swallows, crows and black birds are flying home to their roosts after the long day in the marshlands, a large colony of 250,000 Mexican Long Tailed bats is beginning to stir 30 feet off the ground in the long narrow slits of the cement eight lane Interstate 80 that runs east to west over the wetlands. In flight, they might remind one of swifts, with the long, angular, and narrow wings, and their relatively large size, make them easy to identify. Bats form huge colonies of various sizes like this colony of approximately 250,000 in Northern California to an estimated 30,000,000 in the Bracken Cave in Texas. The habitat of the Mexican free-tailed bats is varied. In the West and Southeast they live mainly in buildings and in the south they are dwelling mostly in caves. Several million bats live in Carlsbad Caverns, and larger nursery colonies live in Mexico, Arizona and Texas. The species is one of the most widely distributed mammalian species in the Western Hemisphere. Northern limits extend from southern Oregon, Nevada, and Utah to Nebraska, Mississippi, to southern North Carolina. From this northern swath, the Mexican Free-tailed Bat ranges southward through most of Central America, Antilles, through most of western South America to central Chile and east to the coastal provinces of Brazil. Their roost under the causeway is the narrow two inch slits that run the length of the underside of the structure where the little bats climb into and hang upside down safely residing without any major predators. The close access to the wetlands and agriculture areas with millions of insects is also a key factor in their choice for ‘hanging out in this area’. The colonies are a major form of agricultural pest control, consuming literally tons of insects each night. It's been estimated that the bats of Bracken Cave in Texas alone can eat 250 tons of insects in a single night. The bats fly high in the sky to feed on flocks of migrating moths, saving crops from millions of corn rootworms each year. Another reason these bats hang out under the causeway is to rear their babies. Each female bears a single pup in June to mid-July. Coming out just as soon as the sunsets and the bugs come out and return at first light at which time they return to their perches under the causeway. In the east and on the west coast this bat hibernates but does not migrate; bats in Texas and the southwest usually migrate to Mexico in October and return in March. Older males may remain on the wintering grounds year-round. Young hang together in a nursery, and mothers return and feed any of them. The lifespan is usually 13-18 years for males and 12 for females, who produce 1 offspring per year. 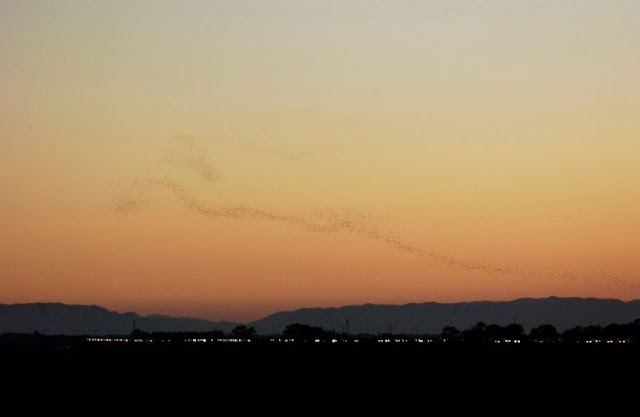 One of my earlier articles and homegrown topics...the large colony of Mexican Long Tailed bats that live underneath the Yolo Bypass causeway between Davis and West Sacramento, California. In the summer, they come out in mass and stream by some trees on their way out to the Yolo Wetlands to feed on moths and other insects.